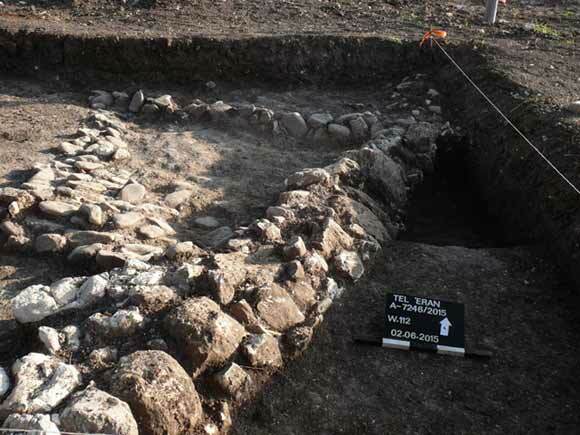 In May–June 2015, a salvage excavation was conducted southeast of Tel ‘Eran near Giv‘at ‘Ada (Permit No. A-7426; map ref. 202860–76/712837–77; Fig. 1), prior to the construction of the eastern gas line. The excavation, undertaken on behalf of the Israel Antiquities Authority and financed by the Israel Natural Gas Lines, was directed by A. Massarwa (photography), with the assistance of Y. Amrani and E. Bachar (administration), R. Mishayev (surveying and drafting), C. Ben-Ari and A. Dagot (GPS), P. Gendelman (ceramics), M. Shuiskaya (pottery drawing), A. Gorzalczany (scientific guidance) and K. Sa‘id and M. Hater. Tel ‘Eran (c. 4 dunams) is located in the southern part of Ramot Menashe, and its southern slope descends toward Nahal Barqan. Five squares were opened along the southeastern fringes of the mound (Fig. 2), of which four were excavated. 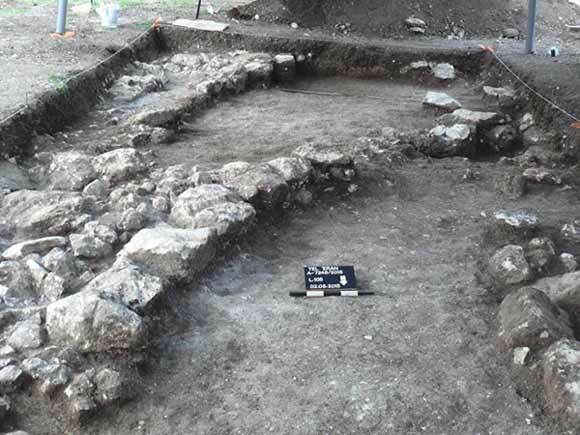 Remains of a building, a wall and an installation dating from the Byzantine period were discovered. Pottery sherds that date from the Chalcolithic, Early Bronze I, Middle Bronze II, Late Bronze, Iron I–II and Byzantine periods were gathered in a survey previously performed on the tell (Gadot and Tepper 2009: Site 192). 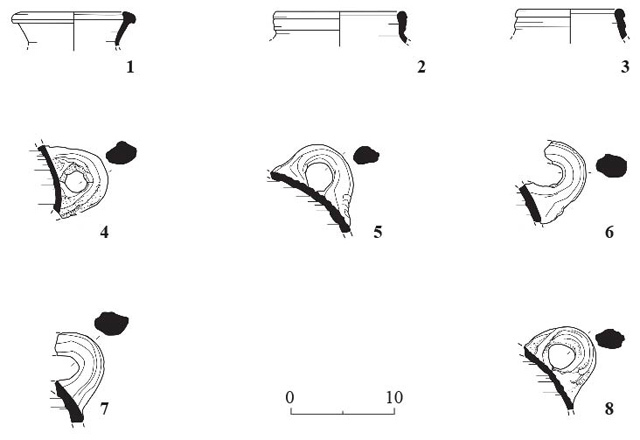 In 1962, excavations conducted in the western part of the mound revealed tombs from the Chalcolithic period, a building from the Iron Age I and II and fragments of pottery vessels from other periods (Giveon 1970; Fig. 1:1). An excavation carried out on the tell in 2002 yielded building remains and pits containing sherds from the Early and Middle Bronze Ages, as well as numerous pottery fragments dating from the Pottery Neolithic, Chalcolithic and Middle Bronze II periods and a small amount of sherds from the Iron Age II (Dagan and Eisenberg 2007; Fig. 1:2). Two walls (W106—exposed length 5 m, width 0.5 m; W108—exposed length 3.4 m, width 0.5 m; Fig. 3), founded on the soil and built of dressed limestone (0.2 × 0.5 × 0.7 m) with earth and small stones in between, were discovered in the southern part of the excavation area. The walls survived to a height of one course. Wall 108 continued outside the excavation area. A floor (L113, L115) made of limestone, soil and small stones abutted both of the walls from the east. It seems that the walls and floor were part of a building that extended beyond the limits of the excavation. Jar fragments dating to the Byzantine period (Fig. 4:3–7) were discovered in the southern part of the excavation area. A wall (W112; exposed length 4.4 m, width 0.5 m; Fig. 5) founded on the soil and built of dressed limestone blocks (0.25 × 0.40 × 0.40 m) preserved to a height of only one course was revealed in the northern part of the excavation area. Adjacent to the wall, to its west, was an installation (L117), founded on the soil and built of small limestone fieldstones. Byzantine-period jar Byzantine period (Fig. 4:1, 2, 8) were discovered during the excavation of the wall and the installation. The excavated remains seem to have belonged to the outskirts of a Byzantine-period (sixth–seventh centuries CE) settlement, which was most dense at the top of the tell. The extensive farmland surrounding the tell was used mainly for agriculture, and the settlement evidently did not extend as far as the cultivated area. Dagan Y. and Eisenberg E. 2007. Tel ‘Eran. HA-ESI 119. Gadot Y. and Tepper Y. 2009. 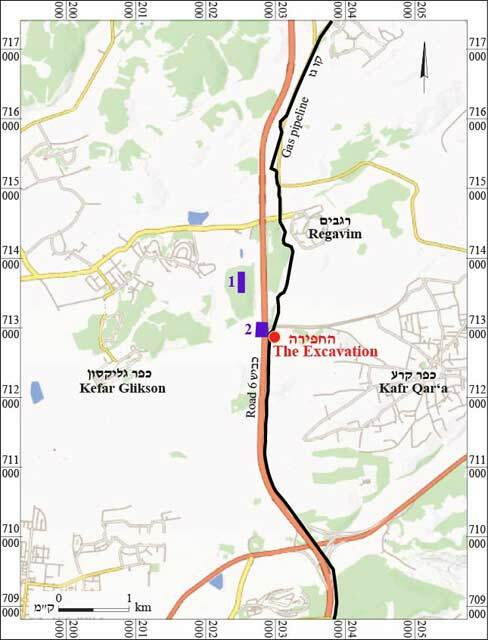 Map of Regevim (49). (Archaeological Survey of Israel). Giveon R. 1970. Tel Eran, Horbat Umm Turos. In Y. Na’aman, ed. Land of Menashe 3. Menashe Regional Council. Pp. 1–5 (Hebrew). 3. South of the excavation area, looking south. 5. Wall 112 and Installation 117, looking north.